I don't know what is more incredible. That this 'Poptimus Prime' contains 4,302 balloons - or that they were all blown up by one man. 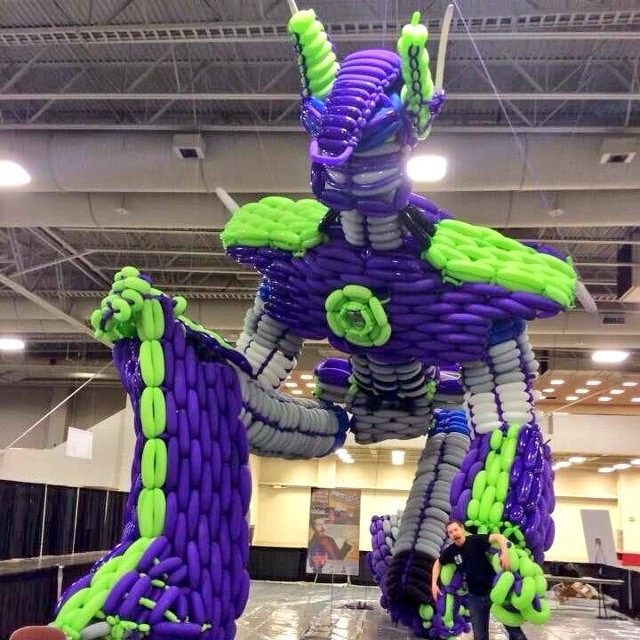 John Reid is his name, and after putting together what is allegedly the world's largest balloon sculpture made by a single person, I don't have the heart to tell him it actually looks more like colour swapped Devastator or Scorponok. You tell him. He likes you. The reason why there's no red or blue balloons? Everyone wants to recreate UP, and they didn't tie purple to their house so it creates a backlog of leftovers. No I'm not just making these facts up. 4 out of 5 people know that. That's seriously impressive....esp like the hand grabbing the man! Very authentic! Glad you liked it Karl - imagine hand blowing all those balloons. You'd never want to see another one again. Let alone where you'd store them all!